Autism Fears Persist Despite Evidence To The Contrary : Shots - Health News An NPR-Thomson Reuters Health Poll finds 21 percent of Americans believe autism is linked to vaccines. Most people believe vaccines work. Among those with concerns about vaccines, uncertainty about long-term health effects is the biggest fear. University of Miami pediatrician Judith L. Schaechter gives an HPV vaccination to a 13-year-old girl last week in Miami. Even before Rep. Michele Bachmann made waves by questioning the safety of vaccines against cervical cancer, there was plenty of resistance to routine immunization. As parents fret, vaccination rates for kids have dipped. Childhood vaccination rates against measles, mumps and rubella (MMR), for instance, fell almost 3 percentage points to 90.6 percent in 2009 from the year before, according to data from private insurers. During the first half of August, we asked people across the country for their views on vaccines in the latest NPR-Thomson Reuters Health Poll. Autism remains a top worry, with 21 percent of respondents saying they believe autism is linked to vaccines. 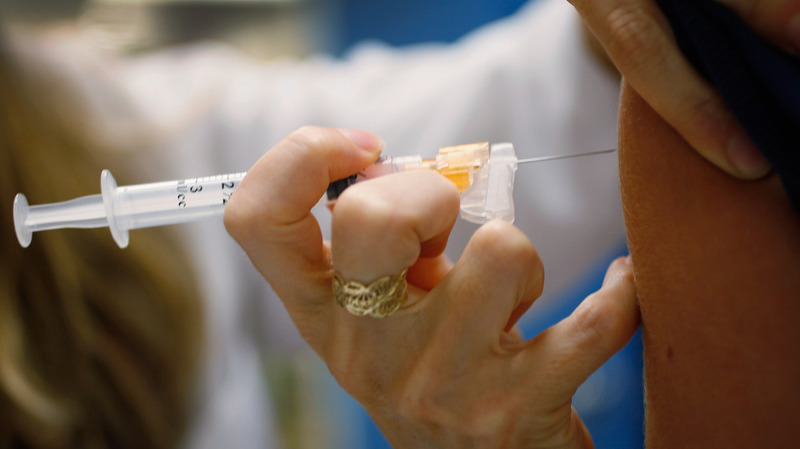 About 7 percent believe in a link between vaccines and diabetes. "The MMR vaccine does not cause autism. The MMR and the DTaP do not cause Type 1 diabetes. And the killed flu vaccine does not cause Bell's palsy, and it does not trigger episodes of asthma." Overall, a little more than a quarter of households had concerns about the safety or value of vaccines. Among households with kids younger than 18, 30 percent had one of those concerns. People 65 and up had the fewest worries, with 19 percent expressing concern. Most people believe vaccines work. Among those who expressed a concern about vaccines, only 4 percent said it was over a lack of effectiveness. The more common issues for those with concerns were a fear of side effects (46 percent of the group) or uncertainty about long-term health effects (47 percent). We wondered if people's opinions about vaccines had changed in the last five years. Nearly a quarter said they had. In that group, 59 percent said their opinions had become less favorable. A little more than a third said their opinions had gotten better. How do the results square with the scientific evidence supporting vaccine safety and effectiveness and a steady campaign by doctors and public health officials to boost confidence? "The human mind has a hard time accepting things that didn't happen versus things that could happen," Dr. Raymond Fabius, chief medical officer at Thomson Reuters, tells Shots. "Vaccines get devalued because of their great effectiveness." Older people still remember when polio was a much bigger worry than cancer, he says. Now, in this country, many people have never seen the toll polio and other infectious diseases took before widespread vaccination. The latest NPR-Thomson Reuters Health Poll drew responses from telephone interviews with more than 3,000 adults across the country. The margin for error is plus or minus 1.8 percentage points. You can find the full text of the questions and the responses here. Find the results of past polls by clicking on the NPR-Thomson Reuters Poll tag below.